At Nottingham Business School we aim to provide a gratifying challenge, hands-on and rewarding educational experience in a world class environment. Our mission is to provide education and research in business, management and economics that combines academic excellence with impact. NBS’ Accounting and Finance courses are placed at 8th, Economics at 13th and Business and related subjects in 18th position in the 2019 Guardian League table. We are one of the UK’s largest and most popular universities, with over 30,000 students studying across four campuses. By choosing Nottingham Business School you can be sure that you will graduate with the qualifications needed to open the door to an exciting and rewarding career. 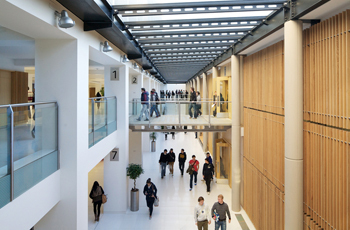 The university has invested £450 million in estates and facilities in the past 15 years. We’ve given our libraries a brand new look, revamped historic buildings, and built start-of-the-art new ones. The MBA courses at Nottingham Business School offer you a truly life-changing experience and an exceptional opportunity to realise you full potential. The Master of Business Administration (MBA) is the most coveted and internationally recognised postgraduate management degree in the world, and there's a good reason why. It is widely recognised as a passport to a successful management career, enabling managers with a functionalist role to take on a more senior, strategic position, and empowering senior managers to gain the in-depth, strategic knowledge they need to climb even higher. Тwo academic or vocational references. If English is not your first language you need to show that your language skills are strong enough for intensive academic study. IELTS test and some alternative English language tests are accepted. The Masters courses offered by Nottingham Business School give you the opportunity to work or study abroad. If that doesn't appeal to you, they are structured to have an international perspective regardless of your place of study. The option of doing a consultancy project instead of a dissertation in your final semester means that you can develop professional skills while working on a real business problem. NTU was the first university I visited; I instantly fell in love with the modern feel of Newton. Many of the staff and students related to my course explained Nottingham Business School’s great employability ratings and the extra-curricular opportunities the students commonly were involved with. I found my course really interesting, the school doesn’t just focus on your academic skills, but practical experiences. It’s not all about the theory but about putting it into practice. Initially, the course covers general business and some accounting and moves on to delve in to Marketing. It really opened my eyes to the scope that Marketing covers. The assignment briefs can seem quite complicated, but the tutors are really helpful and good at explaining/simplifying them for us. The one year placement was one of the most important influences in my time at Nottingham Business School. It gave me a real life insight into Marketing in practice and it’s made me realise what I do and do not want to do. When choosing a Business School and Masters degree to study, it was important to me that the institution was accredited, had a good ranking, operated in a multicultural environment and offered scholarships. All of which I found at NBS. What stood out for me was the MSc International Business Dual Award programme, but also all they key features offered by NBS such as the employability team, the study environment and student support. The key feature offered for Dual Award students is the opportunity to study abroad for a semester, it is very important in my opinion as living abroad can develop multicultural awareness which is crucial for international business. What key skills have you developed? I have developed a lot more confidence while studying at NBS and I believe my communication and cultural awareness have improved thanks to the diversity of the students enrolled on my course. Will the MSc International Business Dual Award set you apart in the job market? I think obtaining two Masters degrees in 15 months will make me stand out as it is an intense programme. The time spent abroad is also beneficial to my career as it gives me a wider appreciation of global culture and knowledge. I feel the Dual Award will give me more credibility and make my profile more competitive in the international business field. I am a native French speaker and I decided to study in the UK and study abroad in Taiwan. This level of international exposure has shown that I can adapt to a different working environment. It also demonstrates my academic resilience which I hope will appeal to the job market. It is an intense and positive experience that develops many professional skills thanks to the teaching and all they key features available to NBS students. The environment is very professional, well laid out and eye catching. But once you go deeper there is a wealth of opportunities and resources that are readily available if you are ready and willing to take advantage of them. This year I have been involved in many extra-curricular events put on by the Business School from studying in Dijon to taking part in the National Apprentice Challenge. “I think that learning about entrepreneurship and what sort of challenges you face is something that I am going to appreciate many times over my career. Learning about the challenges entrepreneurs face and how you can overcome them will definitely help me be successful. “It was great to build my network a lot more and the support from the staff was really valuable. They were always available to answer questions and offer advice. I found that the NBS MBA complemented my engineering background, it was a natural fit. I really wanted more business and leadership exposure which I felt the NBS MBA offered me. In addition, the MBA was well structured, organised and had a great reputation around the world.The solid curriculum and a great reputation were very importnat or me when choosing a post graduate degree- both of which were offered by Nottingham Business School. The significant factors which I considered were the ranking and an exceptional student experience. The tuition fee was moderate and the university is situated at the heart of one of the most affordable cities in the UK. The AACSB and CFA accreditation's played a vital role in my decision. The significant factors which I considered were the ranking of the university and the exceptional student experience. The tuition feeс wеre moderate and the university is situated at the heart of one of the most affordable cities in the UK. The AACSB and CFA accreditation's played a vital role in my decision. The Masters degree at NBS offered exactly what I was looking for in terms of core modules. I wanted to study a Masters degree in order to widen my scope of knowledge in Finance and Accounting. I found it extremely interesting because the course is based on practical experience rather than theoretical studies. The Business Research Project was the best opportunity provided by NTU. This gave me the experience of different research methodologies and was a step forward to my dream of becoming a researcher. Some key highlights of the course included the fact that it encompasses both academic and social activities, which has helped developed my international persona. Seminars are more interactive because students are always encouraged to work in groups to discuss real-life case studies, scenarios, and current events.The fact that NBS has work based learning that enhanced my understanding and application of knowledge and skills that businesses across the globe require and face. I have gained academic writing skills while my studies at NBS which enabled me to write an article (on Leadership) in NBS LINK Magazine and a research proposal for my Research Project (PhD application).The time I have spent at NBS has helped me create networks with PhD students, professional practitioners through the NBS industry mentor scheme (including partners from RBS, Barclays Bank, KPMG, Lloyds Bank, EY) and academics at NBS who gave me more insights on the PhD degree and teaching experience developing my Professional, Career, and Networking Skills. Do you feel that your overall experience of the programme will make your profile more competitive in the job market? I have delivered a presentation on three case studies at the recent BMC in Belgium to over 400 delegates from business schools across Europe where I was shortlisted amongst 15 delegates representing Nottingham Business School. I also acted as a member of the focus group for NBS’ EQUIS accreditation which will make me stand out of the crowd. My overall experience and achievements gained from various resources available has definitely made my profile competitive. How have you benefited from the services provided by the Employability Team? The employability team guided me in creating and updating my LinkedIn account. They encouraged me to widen my networks through LinkedIn. My experience at NBS has definitely been enjoyable. You can tell when a tutor is passionate about what they are teaching and this makes the course so much better for us. Staff are always willing to find the time to help you, whether that is meeting in person or through email, which I value the most. I have also gained a lot of teamwork skills through working in group projects and in seminars where we discuss our ideas amongst ourselves and start a discussion. My experience at NBS has definitely been enjoyable. Of course, there are times when it is challenging, but you would expect that on any degree. You can tell when a tutor is passionate about what they are teaching and this makes the course so much better for us. “I like that the modules are different – some are more maths related than others which I particularly enjoy and then others are more theory based but tutors make sure that they are related back to real life and how these differ. The module team take the ideas and develop them in more depth and constantly challenge us, particularly in seminars where we are left to come up with answers ourselves and then have a discussion, not just be told what is right or wrong. “My studies have already helped me to secure a placement in my third year with HSBC. Without the skills that I learnt in my first and second year, particularly working in groups, I would not have achieved this and I know that this will continue in my final year and help me to get the graduate job that I want. “I have gained a lot from my time at NTU. Staff are always willing to find the time to help you, whether that is meeting in person or through email, which I value the most. I have also gained a lot of teamwork skills through working in group projects and in seminars where we discuss our ideas amongst ourselves and start a discussion. As clichéd as it sounds, I have definitely got friends that I will stay in touch with for a long time after NTU and that is something I really value.